Like hurricanes, emerging risks are hard to predict; we can’t pinpoint when risks will become real issues or how serious they’ll be, but we still need to be prepared to address them. So, how can you begin identifying emerging risks and responding to them appropriately? Emerging risks can result from trends or events that occur suddenly and are often characterized by uncertainty in terms of probability, expected loss, and potential impact. As a result, they are constantly developing and changing over time, so they need to be reviewed often—approximately every three months. Advisors should assess the impact and likelihood of emerging risks based on their business and respond by implementing preventative steps to limit the impact. Identifying which ones are relevant and important to your business is an individual matter. Paying attention to expert resources helps, as does keeping an eye on current trends. 1) Conduct emerging risk reviews. Develop a formal, documented way of identifying, assessing, and reviewing emerging risks. 2) Integrate reviews into the strategic planning process. Companies need a disciplined approach for determining the importance and potential impact of uncertainties on their objectives. 3) Identify assumptions and perform disciplined assumption testing. A method of testing assumptions and beliefs in existing business models can prevent the organization from prioritizing known risks and overlooking emerging risks. 4) Challenge conventional thought processes and expectations. Look into what’s logically most likely to happen and what’s possible with each risk. Once an emerging risk has been identified, it needs to be assessed, and a strong mitigation strategy must be built around it. 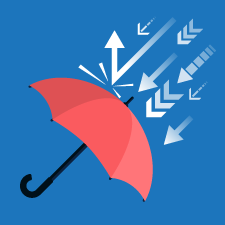 Every organization should have its own risk response strategy, including a rating scale for determining the impact and likelihood of each risk in relation to the size, complexity, risk appetite, and business culture. You should also take into account the controls your organization has in place to mitigate these risks and whether they are sound. 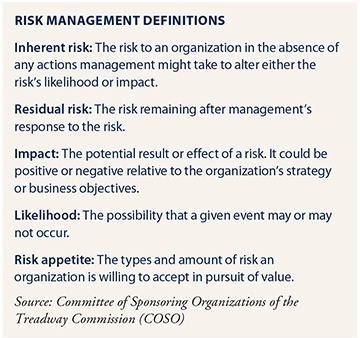 Consider the risk before controls are in place (inherent risk) and the risk after controls are in place (residual risk). Accept it: Analyze the risk and decide not to do anything about it. Transfer it: Pass risk ownership to a third party (e.g., insurance, performance bonds, warranties, or guarantees). Mitigate it: Apply activities that seek to reduce the impact and likelihood of a risk to an acceptable tolerance (e.g., attesting to having had a verbal conversation with your client to confirm that the request is valid). Avoid it: Use an alternate approach that eliminates the risk driver or impact (e.g., ceasing a product line, declining to expand to a new geographical market, or selling a division). The term “risk” carries a negative connotation for most people—something bad will happen, you will lose money, crash your car, and so on. Contrary to this perception, risk is neither only good nor only bad. It is merely an event that has the potential to affect your objectives. We just seem to place a greater emphasis on the loss rather than the gain. Taking risks drives progress within an organization, but assessing the impact is key to understanding whether there is a negative or positive effect on the business. What emerging risks do you anticipate affecting your office in the next year? Five years? Beyond? Looking past today’s risks to tomorrow’s emerging trends and conducting strategic planning around these risks is an opportunity to be proactive and add value to your organization’s future. Do you and/or your colleagues spend time trying to identify emerging risks to your practice? Do you have a risk response strategy in place? Please share your thoughts with us below.